The Kanem–Bornu Empire was an empire that existed in modern Chad and Nigeria. It was known to the Arabian geographers as the Kanem Empire from the 8th century AD onward and lasted as the independent kingdom of Bornu (the Bornu Empire) until 1900. 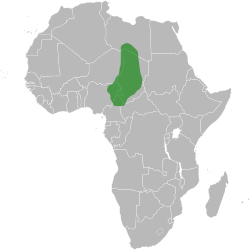 The Kanem Empire (c. 700–1380) was located in the present countries of Chad, Nigeria and Libya. At its height it encompassed an area covering not only most of Chad, but also parts of southern Libya (Fezzan) and eastern Niger, northeastern Nigeria and northern Cameroon. The Bornu Empire (1380s–1893) was a state of what is now northeastern Nigeria, in time becoming even larger than Kanem, incorporating areas that are today parts of Chad, Niger, Sudan, and Cameroon; is existed from 1380s to 1893. The early history of the Empire is mainly known from the Royal Chronicle or Girgam discovered in 1851 by the German traveller Heinrich Barth. Kanem was located at the southern end of the trans-Saharan trade route between Tripoli and the region of Lake Chad. Besides its urban elite it also included a confederation of nomadic peoples who spoke languages of the Teda–Daza (Toubou) group. In the 8th century, Wahb ibn Munabbih used Zaghawa to describe the Teda-Tubu group, in the earliest use of the ethnic name. Muhammad ibn Musa al-Khwarizmi also mentions the Zaghawa in the 9th century. Kanem comes from anem, meaning south in the Teda and Kanuri languages, and hence a geographic term. During the first millennium, as the Sahara underwent desiccation, people speaking the Kanembu language migrated to Kanem in the south. This group contributed to the formation of the Kanuri people. Kanuri traditions state the Zaghawa dynasty led a group of nomads called the Magumi. The origins of Kanem are unclear. The first historical sources tends to show that the kingdom of Kanem began forming around 700 AD under the nomadic Tebu-speaking Kanembu. The Kanembu were supposedly forced southwest towards the fertile lands around Lake Chad by political pressure and desiccation in their former range. The area already possessed independent, walled city-states belonging to the Sao culture. Under the leadership of the Duguwa dynasty, the Kanembu would eventually dominate the Sao, but not before adopting many of their customs. War between the two continued up to the late 16th century. One scholar, Dierk Lange, proposed another theory based on a diffusionist ideology. This theory was much criticised by the scientific community, as it seriously lacks of direct and clear evidences. He connect the creation of Kanem-Bornu with exodus from the collapsed Assyrian Empire c. 600 BC to the northeast of Lake Chad.. An overview of the discussions regarding this theory are gathered in his personal web page . Another one, from the same author, proposes that the lost state of Agisymba (mentioned by Ptolemy in the middle of the 2nd century AD) was the antecedent of the Kanem Empire. Kanem is mentioned as one of three great empires in Bilad el-Sudan, by Al Yaqubi in 872. He describes the kingdom of "the Zaghāwa who live in a place called Kānim," which included several vassal kingdoms, and "Their dwellings are huts made of reeds and they have no towns." Living as nomads, their cavalry gave them military superiority. In the 10th century, al-Muhallabi mentions two towns in the kingdom, one of which was Mānān. Their king was considered divine, believing he could "bring life and death, sickness and health." Wealth was measured in livestock, sheep, cattle, camels and horses. From Al-Bakri in the 11th century onwards, the kingdom is referred to as Kanem. In the 12th century Muhammad al-Idrisi described Mānān as "a small town without industry of any sort and little commerce." Ibn Sa'id al-Maghribi describes Mānān as the capital of the Kanem kings in the 13th century, and Kanem as a powerful Muslim kingdom. According to Richmond Palmer, it was customary to have "the Mai sitting in a curtained cage called fanadir, dagil, or tatatuna...a large cage for a wild animal, with vertical wooden bars." The administrative reforms and military brilliance of Aluma sustained the empire until the mid-17th century when its power began to fade. By the late 18th century, Bornu rule extended only westward, into the land of the Hausa of modern Nigeria. The empire was still ruled by the Mai who was advised by his councilors (kokenawa) in the state council or "nokena". The members of his Nokena council included his sons and daughters and other royalty (the Maina) and non-royalty (the Kokenawa, "new men"). 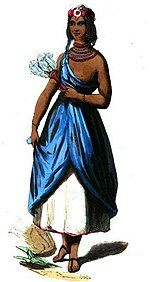 The Kokenawa included free men and slave eunuchs known as kachela. The latter "had come to play a very important part in Bornu politics, as eunuchs did in many Muslim courts." Kanembu warriors and their mounted chief in an illustration from Heinrich Barth's Travels and Discoveries, Vol. III, 1857. ^ "Kanem-Bornu". Encyclopædia Britannica. Retrieved 24 September 2014. ^ a b c d Levtzion, Nehemia (1978). Fage, J.D. (ed.). The Sahara and the Sudan from the Arab conquest of the Maghrib to the rise of the Almoravids, in The Cambridge History of Africa, Vol. 2, from c. 500 BC to AD 1050. Cambridge: Cambridge University Press. pp. 667, 680–683. ISBN 0521215927. ^ a b c d e f g h i j k Smith, Abdullahi (1972). Ajayi, J.F. Ade; Crowder, Michael (eds.). The early states of the Central Sudan, in History of West Africa, Volume One. New York: Columbia University Press. pp. 168–172, 199–201. ISBN 0231036280. ^ Urvoy, Empire, 3–35; Trimingham, History, 104–111. ^ Lange, Founding of Kanem, 31–38. ^ "The Mune as the Ark of the Covenant between Duguwa (Kanembu) and Sefuwa (Kanembu - Mayi)" Borno Museum Society Newsletter 66–67 (2006), 15–25. (The article has a map (page 6) of the ancient Central Sahara and proposes to identify Agisymba of 100 CE with the early Kanem state). ^ a b c d e f Urvoy, Y. (1949). Historie De L'Empire Du Bronu (Memoires De L'Institut Francais D'Afrique Noire, No. 7 ed.). Paris: Librairie Larose. p. 21. ^ Levtzion, Nehemia (1973). Ancient Ghana and Mali. New York: Methuen & Co Ltd. p. 3. ISBN 0841904316. ^ a b c d e Meredith, Martin (2014). The Fortunes of Africa. New York: PublicAffairs. pp. 71, 78–79, 159–160. ISBN 9781610396356. ^ a b c d e f g h Shillington, Kevin (2012). History of Africa. Palgrave Macnikkan. pp. 94, 189. ISBN 9780230308473. ^ Koslow, Philip (1995). Kanem-Borno: 1,000 Years of Splendor. New York: Chelsea House Publishers. pp. 14, 20–21, 23. ISBN 0791031292. ^ a b c d e f g h i j Palmer, Richmond (1936). The Bornu Sahara and Sudan. London: John Murray. pp. 166, 195, 223. ^ Smith, "Early states", 179; Lange, "Kingdoms and peoples", 238; Barkindo, "Early states", 245–6. ^ Brenner, Shehus, 46, 104–7. ^ Ajayi, J. F. Ade. ; Espie, Ian, eds. (1965). A Thousand Years of West African History: A Handbook for Teachers and Students. Ibadan, Nigeria: Ibadan University Press. p. 296. ^ a b c Hiribarren, Vincent (2017). A History of Borno: Trans-Saharan African Empire to Failing Nigerian State. London: Hurst & Company. pp. 19–20. ISBN 9781849044745. Barkindo, Bawuro: "The early states of the Central Sudan: Kanem, Borno and some of their neighbours to c. 1500 AD. ", in: J. Ajayi und M. Crowder (ed. ), History of West Africa, Bd. I, 3rd ed. Harlow 1985, 225–254. Barth, Heinrich: Travel and Discoveries in North and Central Africa, vol. II, New York, 1858, 15–29, 581–602. Brenner, Louis, The Shehus of Kukawa, Oxford 1973. Kanem-Borno, in Thomas Collelo, ed. Chad: A Country Study. Washington: GPO for the Library of Congress, 1988. Cohen, Ronald: The Kanuri of Bornu, New York 1967. Hallam, W.: The life and Times of Rabih Fadl Allah, Devon 1977. Hiribarren, Vincent, A History of Borno: Trans-Saharan African Empire to Failing Nigerian State (London: Hurst & Oxford University Press, 2017). Hughes, William (2007). A class-book of modern geography (Paperback). Whitefish, MT: Kessinger Publishing. p. 390 Pages. ISBN 1-4326-8180-X. Lange, Dierk: Le Dīwān des sultans du Kanem-Bornu, Wiesbaden 1977. -- A Sudanic Chronicle: The Borno Expeditions of Idris Alauma (1564–1576), Stuttgart 1987. -- "Ethnogenesis from within the Chadic state", Paideuma, 39 (1993), 261–277. -- "The Chad region as a crossroads", in: M. Elfasi (Hg. ), General History of Africa, vol. III, UNESCO, London 1988, pp. 436–460. -- "The kingdoms and peoples of Chad", in: D. T. Niane (ed. ), General History of Africa, vol. IV, UNESCO, London 1984, pp. 238–265. --: "An introduction to the history of Kanem-Borno: The prologue of the Dīwān", Borno Museum Society Newsletter 76–84 (2010), 79–103. --: The Founding of Kanem by Assyrian Refugees ca. 600 BCE: Documentary, Linguistic, and Archaeological Evidence, Boston 2011. Levtzion, Nehemia, and John Hopkins: Corpus of Early Arabic Sources for West African History, Cambridge 1981. Nachtigal, Gustav: Sahara und Sudan, Berlin, 1879–1881, Leipzig 1989 (Nachdruck Graz 1967; engl. Übers. von Humphrey Fisher). Oliver, Roland & Anthony Atmore (2005). Africa Since 1800, Fifth Edition. Cambridge: Cambridge University Press. p. 405 Pages. ISBN 0-521-83615-8. Shillington, Kevin (2005). Encyclopedia of African History Volume 1 A–G. New York: Routledge. pp. 1912 pages. ISBN 1-57958-245-1. Smith, Abdullahi: The early states of the Central Sudan, in: J. Ajayi and M. Crowder (ed. ), History of West Africa, vol. I, 1st ed., London, 1971, 158–183. Urvoy, Yves: L'empire du Bornou, Paris 1949. Trimingham, Spencer: A History of Islam in West Africa, Oxford 1962. Van de Mieroop, Marc: A History of the Ancient Near East, 2nd ed., Oxford 2007. Zakari, Maikorema: Contribution à l'histoire des populations du sud-est nigérien, Niamey 1985. Zeltner, Jean-Claude : Pages d'histoire du Kanem, pays tchadien, Paris 1980. Barkindo, Bawuro, "The early states of the Central Sudan: Kanem, Borno and some of their neighbours to c. 1500 A.D.", in: J. Ajayi und M. Crowder (Hg. ), History of West Africa, Bd. I, 3. Ausg. Harlow 1985, 225–254. Dewière, Rémi, Du lac Tchad à La Mecque. Le sultanat du Borno et son monde (16-17e siècle), Paris, Publication de la Sorbonne, 2017. Wikisource has the text of the 1911 Encyclopædia Britannica article Bornu.